So you’d think I’d be sick of snowflakes–and of the real stuff, I am–and it’s still the first half of January! But I still like my thread snowflakes. These are more of the tatted snowflakes that I’ve shown off in the past. I think I’m going to count this project as “done” now. For one thing, it’s the sort of project that could go on indefinitely–how many snowflakes on a tree is too many?–so if I don’t call an end point it will never be done. For another, I’d really like to cross it off my list. But I might still continue to make some of the small ones–they go fast. To finish the snowflakes I soaked them in a 50/50 water and white glue solution and let them dry. I can’t wait to add them to my snowflake tree next year! I love them! The big six-sided one is my favorite. 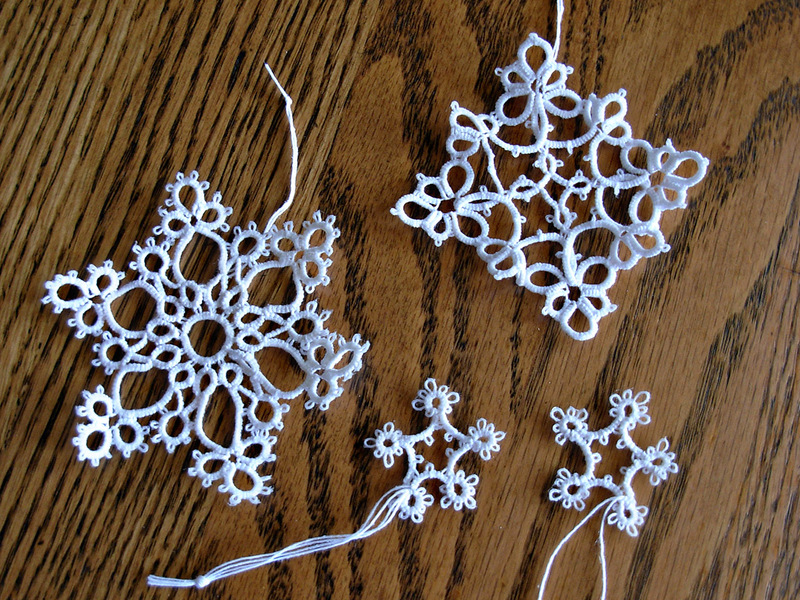 I have a set of crocheted snowflakes that my mom made for our tree…they’re my favorite ornaments.